* In 1980 was established the company for manufacturing high quality lubricants and automotive chemicals. * In 1987 the company was transformed to anonymous company (S.A.). * In 1992 participated for first time in the greatest international exhibition in “Automechanika” Frankfurt where we closed the first deal for export in Hong Kong and from then till now we expanded our exports in five (5) continents and in more than fourty-five (45) countries all over the world. 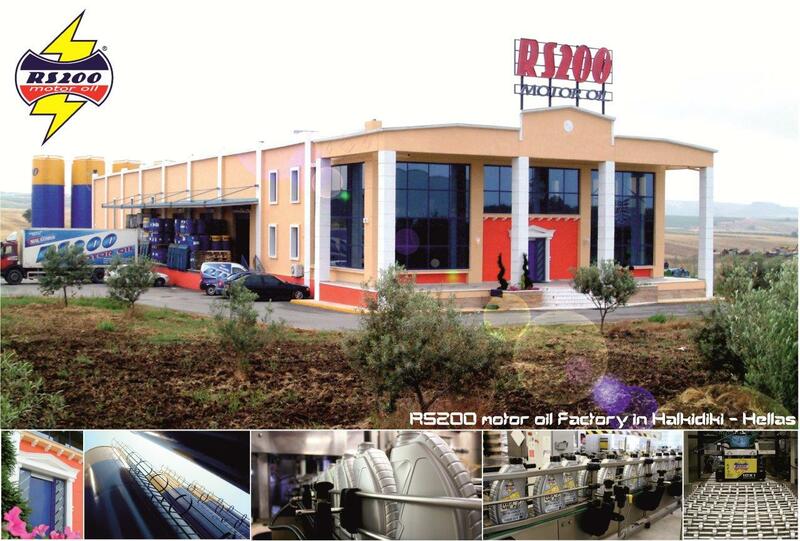 * In 1999 the factory and the headquarters moved from Thessaloniki to Industrial Park of Lakkoma in Halkidiki at our owned 14.000m2 area. * In 2001 modernized the production by adding a full automatic bottling line, which increased the production to 3.000bottles of 1L per hour. * In 2004 built in our owned area an exterior tank farm of first materials with total capacity 1.700MT (metric tons). * In 2007 established the subsidiary company “BioEnergia”, which produces Biodiesel and supplies majorly the Greek government refineries. * In 2010 RS200 motor oil celebrates the 30 successed years since the establishing day. * In 2011 started the production of our new pioneering design packages. * In 2014 we developed our grease production equipments for producing more types of greases and more quantities of them.